The services related to real estate activities also followed this performance. The annual gross revenue of real estate services in the State leaped from US$ 2.15 billion (2007) to US$ 3.2 billion (2011). São Paulo’s share represents 42% of the total Brazilian revenue (US$ 15 billion) – (IBGE – 2011). Among the main reasons are the control of inflation and the increase in the number of formal jobs and the population income. In the last decade, 30.5 million Brazilians joined the middle class and 20.5 million people left the poverty line across Brazil. The country is undergoing a balance of population growth.The expectation is that it reaches the level of 215 million people in 2050, with over 90% of the population in urban areas. According to the Housing Union of São Paulo (Secovi-SP), between 2010 and 2012, the real estate market consolidated the movement of recovery initiated after overcoming the effects of the international financial crisis. The buyer kept the consumption pace and entrepreneurs did the same for launches. The middle class led the acceleration in the sector with the purchase of two-bedroom units, from 45 square meters to 60 square meters. Represented by the city of São Paulo and 38 other municipalities in the surrounding area, the Metropolitan Region of São Paulo (RMSP) in 2012 registered the sale of 50,903 units in contrast to 52,839 properties sold in 2011. The decrease in the volume of launches corresponded to 19.7% in 2012 (54,059 units) compared to total new units in the same region in 2011 (67,359). Two-bedroom models grew in the share on total properties sold. There were 27,437 real estate properties of this type in 2012, that is, 53.9%. The share of the city of São Paulo in sales of the metropolitan region indicated a slight reduction over the past two years. The ratio was 53.6% in 2011 and 53.0% in 2012. The variation was higher in the comparison of launches between the capital and the Metropolitan Region: the 56.6% of launches in the Greater São Paulo in 2011 fell to 51.5% in 2012 (Secovi-SP). Over the past few years there has been an increasing migration of people to inland cities, especially cities within a radius of 100-150 km from the capital. Quality of life, safety, availability of areas, better prices, infrastructure and mobility are the main reasons that stimulate the growth of the real estate market in the State. According to the Brazilian Association of Real Estate Loans and Savings Companies (Abecip), the granting of credit with funds from savings accounts increased 3.6% in figures. 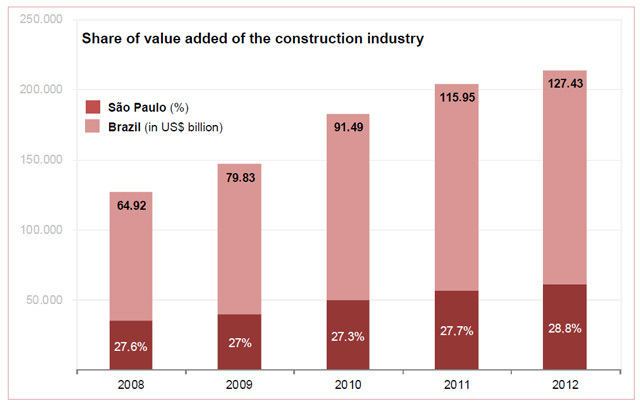 Throughout Brazil, R$ 82.8 billion was used in financing in 2012, compared to R$ 79.9 billion in 2011. The comparison of the 453,000 units contracted in the year with the 493,000 units in 2011 leads to an 8% drop. Special mention to Load to Value (LTV) ratio, which was 63.8%. This means that the buyer contributed with its own funds (savings) of approximately 36.2% of the property value in the average year's operations in order to complement the funding provided by the financial agent. The LTV in 2011 was 63.0%, and in 2010, 62.0%. (Secovi-SP). Why invest in the Real Estate Market in São Paulo? The State concentrates over 20% of the national population. Largest producer and consumer markets in Brazil. Excellent infrastructure and quality of life in the municipalities. Skilled workforce and strong activity directed to construction. 90% of the population concentrated in urban areas.